Information about 511 original versions of recordings by singer and entertainer Elvis Presley. See when the original was recorded and by whom, with interesting historical data. Hear soundbites of original versions. This is the original site of information about original versions of numbers recorded by Elvis Presley, which I began in about 1995. Other sites have copied it, some have translated it, but this site is the one that is best maintained. This list only includes numbers that were recorded by someone before Elvis's own version: it does not include numbers that Elvis recorded first. WARNING: This site is designed to be used with modern CSS2-compliant browsers. It would appear that you are using an outdated browser. 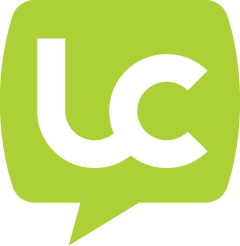 This site will work and look better in a browser that supports web standards, but it is accessible to any browser or Internet device (I think!). 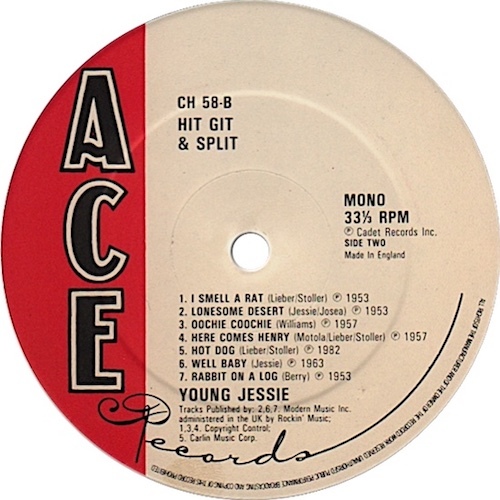 Young Jessie recorded this number in 1956 for the Modern label, but it was not issued until 1982 as part of the 14-track "Hit, Git & Split" LP of Young Jessie material on Ace CH 58. A different number by the same name was recorded by Buck Owens under the pseudonym Corky Jones. Young Jessie was actually Obediah Donnell, originally a baritone singer with the Flairs (another member was Richard Berrie, who wrote "Louie Louie"). Rock'n'Roll in a nutshell: one of the truly great rock songs, written by one of the truly great rock writing teams, Jerry Leiber and Mike Stoller, and performed by the truly great performer, Elvis. 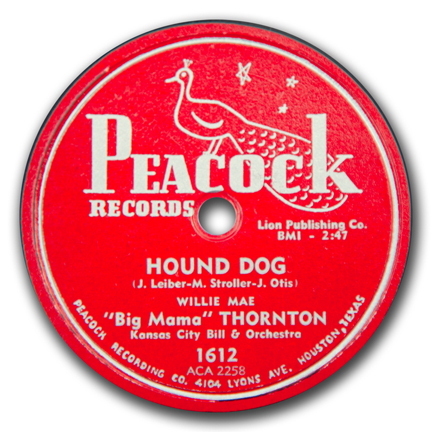 But before him came Big Mama Thornton's version, which itself sold more than two million copies! Although released in 1953, the original recording was actually made in 1952. Its release was delayed, however, because of Johnny Otis's assertion that he should share in the authors' rights. Although Thornton had the original, Elvis did not base his version on hers. Rather, it would seem that he was heavily influenced by the performance of the number by Freddie Bell and The Bellboys, whom he saw during his first stint in Las Vegas. Indeed, Elvis used Bell's lyrics, rather than those originally penned by Jerry Leiber. 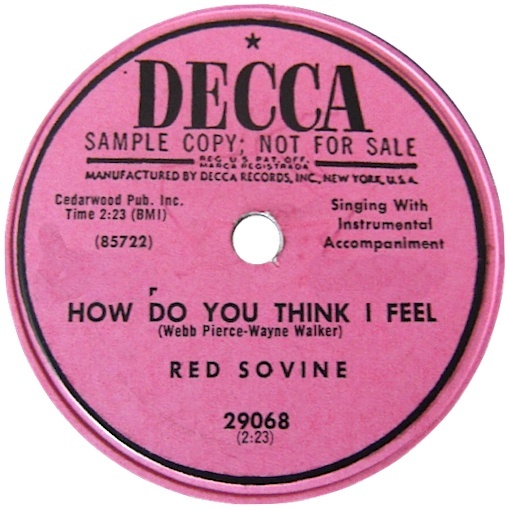 For a long time I had doubts as to whether Jimmie Rodgers Snow or Red Sovine was responsible for the original of "How Do You Think I Feel." Both artists had singles with the song in 1954, but it was indeed Red Sovine who recorded the original version on 12 January, 1954. 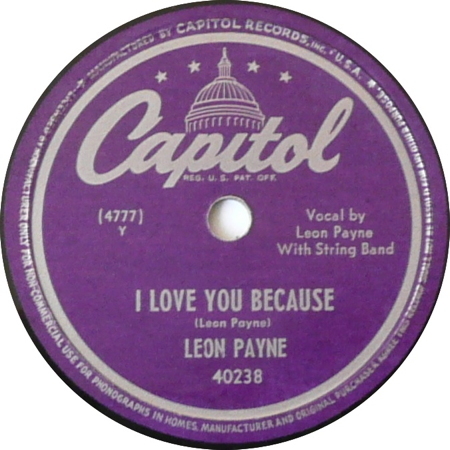 This recording was released as a single in April 1954 on Decca 29068. 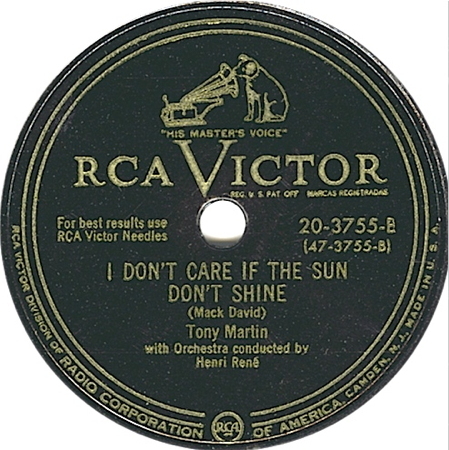 Jimmie Rodgers Snow's version was recorded a few weeks later than Sovine's, on 22 February, 1954, and only released in November of that year on RCA Victor 47-59000. This number comes originally from Sweden, with English words by Stuart K. Hine, a British Methodist missionary. The number was originally a 9-verse poem called "O Store Gud" and was written in 1885by Pastor Carl Boberg, inspired during a visit to a country estate in the south-east of Sweden, when he was caught in a huge thunderstorm which was followed by clear and brilliant sunshine and he then heard birds singing nearby. The poem was first published the following year. Several years later the words were set to a traditional Swedish folk melody. A German version was created in 1907 and some 5 years later a Russian version. English lyrics were provided for the first three verses by the Rev. Stuart Hine in about 1933 and for the fourth verse in 1947. Elvis loved singing this number in concert. 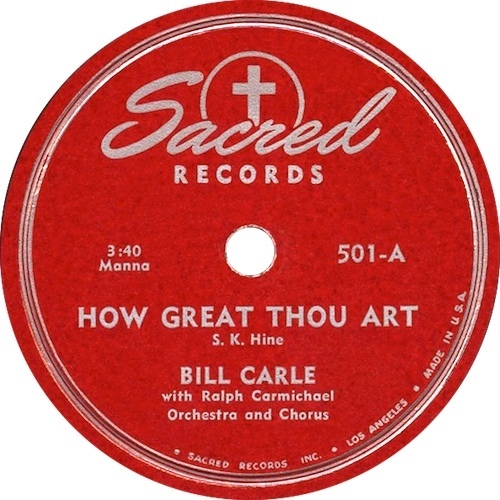 The Manna Music site states, "The first major American recording of How Great Thou Art was by Bill Carle." This statement seems to suggest that there were lesser American recordings, or recordings made outside the USA, prior to Carle's recording. Any suggestions? contact me. Jackie Lomax was born John Richard Lomax on 10 May, 1944, in Wallasey, Cheshire. He was a member of several UK groups, but never achieved great success. 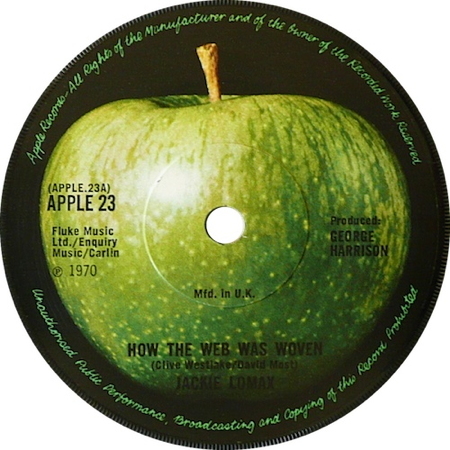 This number was recorded by Lomax as his final single for the Beatles' Apple label. It was selected and produced by George Harrison. 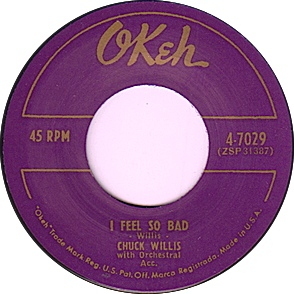 Lomax's single had another Elvis connection: the B-side, "Thumbin' a Ride", was written by Leiber and Stoller. Composer Clive Westlake's version of his own song was released in late 1973 on RCA2441 in the UK. Lomax died on 15 September, 2013. Roy Hamilton was born in 1929. As a young man he sang in church and in a gospel quartet, The Searchlight Singers. He was discovered singing in a club in Newark, New Jersey, in 1953. His original recording of "hurt" was released on Epic 9086 and reached number eight on the R&B chart. 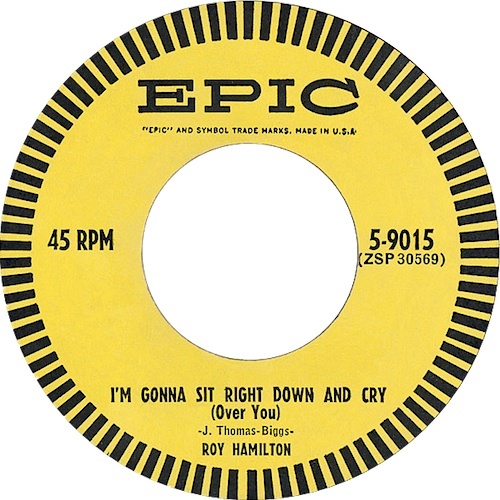 Hamilton released more than 50 singles during his career, which was cut short in July 1969 when he suffered a stroke. 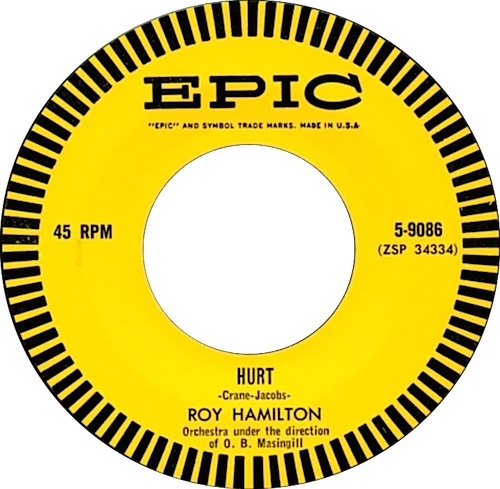 Roy Hamilton is the typical big ballad singer that Elvis really liked. In addition to "Hurt," Elvis also recorded "You'll Never Walk Alone," Hamilton's first record and a major success in 1954. "I Apologize" is probably most associated with Billy Eckstine, who had a million-selling hit with it in 1951. The number was, however, written by Al Hoffman, Al Goodhart and Ed Nelson in the 1930s, when both Bing Crosby and Nat Shilkret scored hits with it. 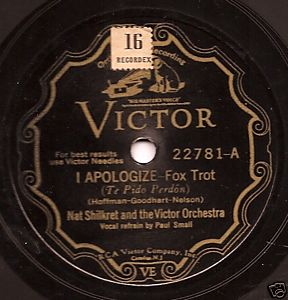 Shilkret made the first recording on 29 July 1931, issued on Victor 22781, closely followed by Crosby on 19 August. There is no certainty that Elvis recorded "I Apologize" officially, though it is rumoured that he may have done so during his Sun days. In 1962 he sang a small part of the song, which can be heard before an alternate take of "Beyond The Bend" ("I Apologize" is not listed and the date for the recording of "Beyond The Bend" in the documentation accompanying the "Collectors Gold" set is incorrect!) and in 1974 he also sang a part of the song on stage in Lake Tahoe after having introduced Billy Eckstine, who was in the audience (this can be heard on the Fort Baxter CD "Last Tango In Tahoe"). RCA released this number on "A Golden Celebration" as "He's Only A Prayer Away." Elvis recorded the number on a Grundig reel-to-reel consumer tape recorder in his rented house in Goethestrasse, Bad Nauheim, during his military service in Germany. 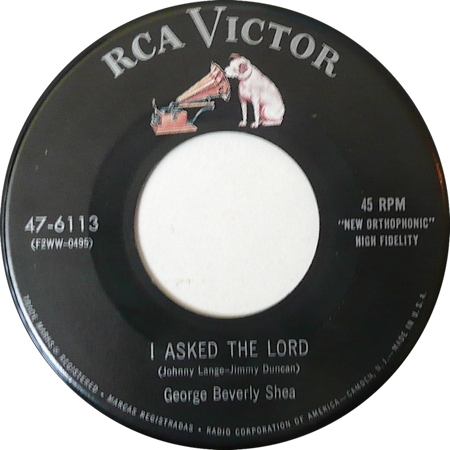 A number of artists had recorded the song earlier, including Kate Smith and Mahalia Jackson, but George Beverly Shea's 1955 recording, probably made in April of that year, on RCA 20-6113, seems to be the original. This was probably the first number to become a hit as a result of television exposure. Jane Froman first sang "I Believe" in her TV series "USA Canteen" in 1952 during the Thanksgiving show. With the Korean War raging and many people worried about the possibility of another World War, Froman asked for a song to be written that would offer some hope. "I Believe" was the result. She was reluctant to record the song, but did so quickly when she learned that it had been given to Frankie Laine to record. 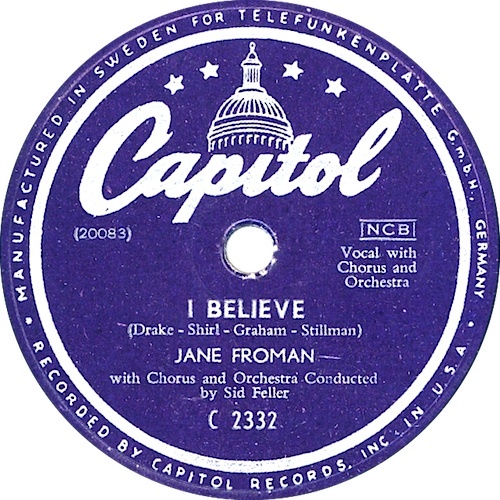 Froman recorded the number on 23 December 1952 (Frankie Laine's recording was made on 8 January 1953, Elvis's 18th birthday) and it was released the next month on Capitol 2332, eventually reaching number 11 on the Billboard Best Selling Singles chart and earning Jane a gold record. Frankie Laine's version of "I Believe" went on to become a huge international hit, including no less than eighteen weeks at the top of the UK charts. Elvis liked the Ink Spots, a wonderful group that enjoyed great success in the late 1930s, the 1940s and into the 1950s. 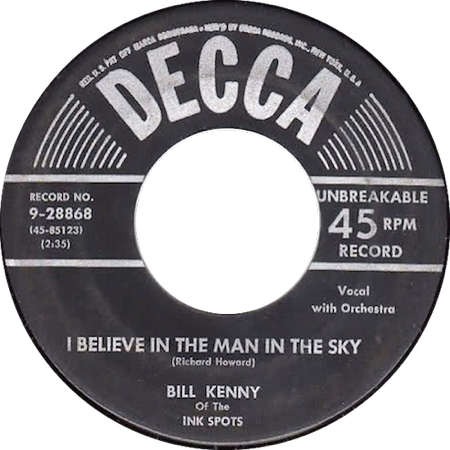 Bill Kenny's high tenor formed the lead vocal for the group for most of this time. In the early 1950s, Bill sang on his own solo recordings, though he maintained the Ink Spots' style of presentation. Kenny died in 1978. Not a Ray Charles original, though I'm sure that most readers would have supplied his name for this number. 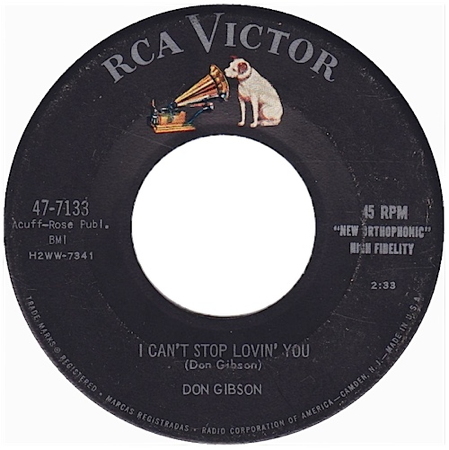 Don Gibson wrote and recorded "I Can't Stop Loving You" as the B-side of his country blockbuster "Oh, Lonesome Me." Gibson preferred "I Can't Stop Loving You." He told Dorothy Horstman in "Sing Your Heart Out, Country Boy," "I sat down to write a lost love ballad. After writing several lines to the song, I looked back and saw the line 'I can't stop loving you.' I said, 'That would be a good title,' so I went ahead and rewrote it in its present form." Gibson's original was released in 1958, though it seems it was recorded in 1957 — only just, however, as the recording date was 30 December 1957. Born in Albany, Georgia, on 23 September, 1930, as Ray Charles Robinson, he suffered from congenitive juvenile glaucoma as a child and was completely blind by the age of seven. Despite this, he learned to read and write music and to play several instruments by the time he was 15. 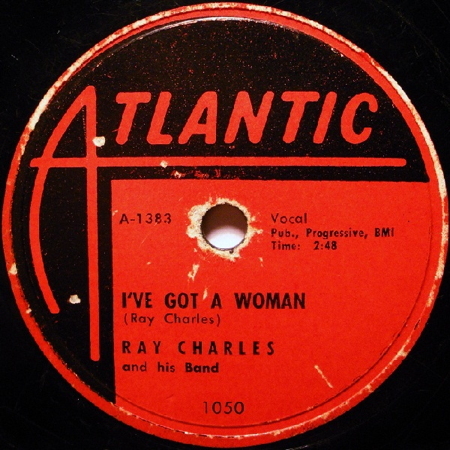 Ray Charles recorded this number as "I've Got A Woman" on 18 November, 1954. It was released as a single on Atlantic 1050. According to Renald Richard, Charles's bandleader at the time, they wrote the number after hearing and singing along to a gospel number, whilst driving to Nashville from a gig in South Bend, Indiana. Charles liked the tune and asked Richard if he could do something with it; the next morning, "I've Got A Woman" was written. The original gospel song was probably an Alex Brown hymn that began, "I've got a saviour, way over Jordan, He's saved my soul, oh yeah..." In December 1950 the "Bailey Gospel Singers" recorded a version as "I've Got A Savior (Across Town)." Ray Charles died in June 2004. How Cliff Richard came to record "I Gotta Know" seems to be a mystery even to its composer, Paul Evans. He was given the choice of letting Fabian or Elvis record the song (now who remembers Fabian?) and chose Elvis, only later to learn that the song had already been recorded by British Elvis wannabe, Cliff Richard, in the September of the previous year, 1959. "I Gotta Know" became one of the tracks on Cliff's imaginatively titled LP, "Cliff Sings," which was his second album (the first was called simply, "Cliff"), released in November 1959. Elvis's version was used as the B-side of "Are You Lonesome Tonight?" but even as a B-side made it to number 14 in the charts! Bill Monroe was born William Smith Monroe on 13 September, 1911, near Rosine, Kentucky. As a child he learned to play mandolin, but when his parents died he went to live with his Uncle Pen (later the subject of one of Monroe's compositions). Having moved to Indiana, where he worked as a manual labourer during the day and played msic at local dances at night, Bill and his brother, Charlie, formed the Monroe Brothers in 1935 and recorded some numbers for Victor Records. In 1938, Bill formed a larger group, the Kentuckians, which would later become the Blue Grass Boys. 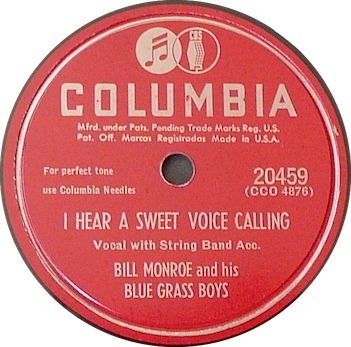 Bill Monroe and his Blue Grass Boys recorded the original version of "I Hear A Sweet Voice Calling," which Monroe himself wrote, on 27 October, 1947 and it was released as a single on Columbia 20459. Bill Monroe died on 9 September, 1996, just short of his 95th birthday. The song is also known as "I Love You" and "I Love Little Baby Ducks." Elvis sang just the first line of the lyrics when starting "Love Me Tender" during a concert at the Middle Tennessee State University in Murfreesboro, Tennessee, in May 1975. Tom T. Hall was born in Olive Hill, Kentucky, in May 1936. He is a prolific songwriter of the storytelling ilk. He has had numerous big hits since the early 1960s, both to his own credit and to that of other recording artists. 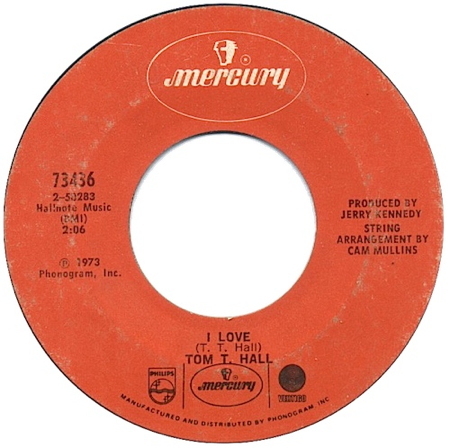 "I Love" was itself a number 1 Country hit in 1973. Perhaps his most widely-known number, however, is "Harper Valley PTA," which was an international success for Jeannie C. Riley in 1968. Other big names that have recorded numbers by Hall include Johnny Cash, George Jones, Lorretta Lynn and Waylon Jennings. Hall was inducted into the Country Music Hall of Fame in 2008. The melody used in this Elvis track is an old French song, "Auprès de Ma Blonde", which apparently dates back to the time of Louis XIV, when it was sung by the French infantry—hardly surprising, as the lyrics are somewhat bawdy and are certainly more suited to a bunch of soldiers than to its use as a children's song ("It feels good to sleep next to my blond girl...")! Eva Gauthier was a French-Canadian singer, born in 1885. Her recording career lasted from 1917 until 1935, during which time her songs were released on various labels. 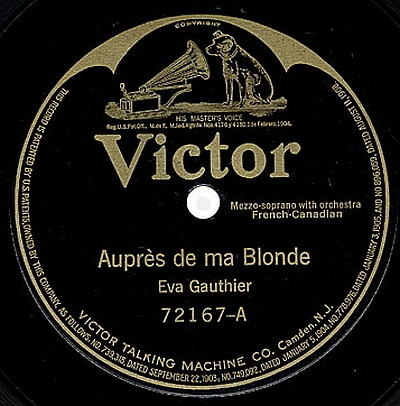 Her stirring version of "Auprès de Ma Blonde" was recorded in New York for Victor in March 1918, but was not released until February 1919. 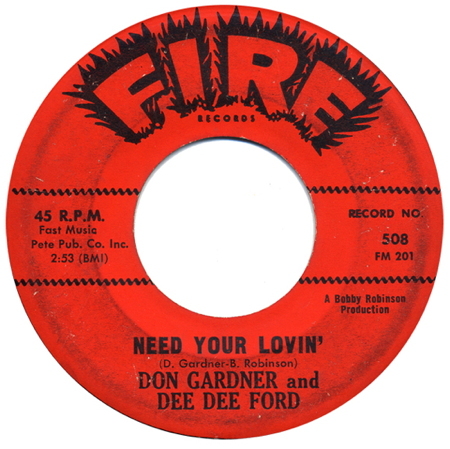 Written by Don Gardner and Bobby Robinson in 1962, "I Need Your Loving (Every Day)" was recorded that same year by Gardner and Dee Dee Ford. 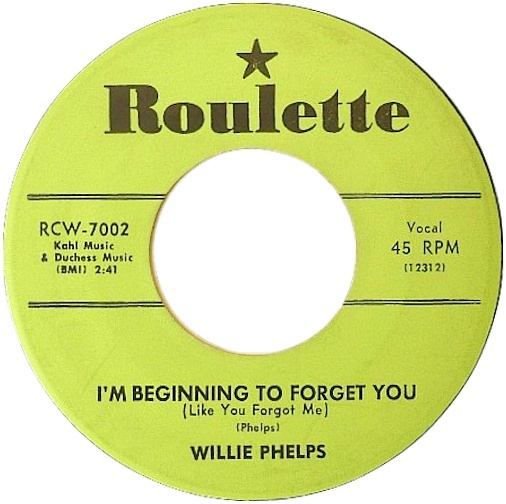 Their version was released as "Need Your Lovin'" on the Fire label, number 508. It reached number 20 on Billboard's Hot 100 and number 4 on the R&B charts. It is reported that Elvis sang "I Need Your Loving (Every Day)" at a few of his 1970 concerts. Pianist-composer Don Robertson was born in Peking in 1922— his father was head of the Department of Medicine at Peking Union Medical College. His mother taught him to play piano from the age of four. His piano-playing style was a major influence in Nashville during the fifties and his writing produced numerous country successes for a plethora of artists. He even scored a big hit hit of his own with "Happy Whistler" in 1956. 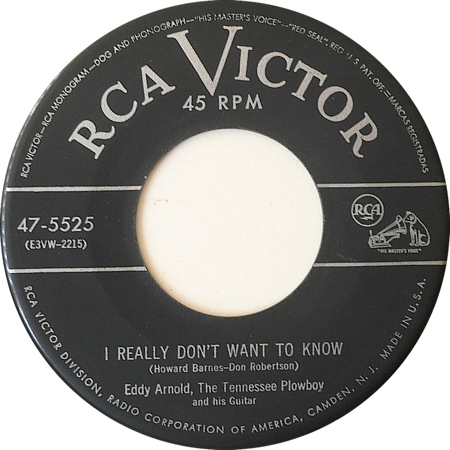 Robertson cut a demo of "I Really Don't Want To Know" in 1953, and it was then officially recorded by Eddy Arnold on 23 October of that same year (a recording made in September has not been released). It went on to reach number 2 in the US Country charts in 1954. Eddy Arnold died in May 2008. Bob Dylan wrote "I Shall Be Released" in 1967 and its first official release was a version by The Band on their 1968 album, "Music From Big Pink." Dylan, however, had already recorded vocals for the song in 1967. Even if this version was not initially intended for commercial release (and that is pure speculation), it eventually found its way onto the demo version of "The Basement Tapes" double LP in 1975, for which Dylan and The Band overdubbed the original vocals in a studio, but did not appear on the official release. Columbia would wait until 1991 to release the track, and this on the CD box set "The Bootleg Series Volumes 1–3 (Rare & Unreleased) 1961–1991." Dylan recorded a second version of "I Shall Be Released" in 1971 and that version was included on the album, "Bob Dylan's Greatest Hits Vol. II." 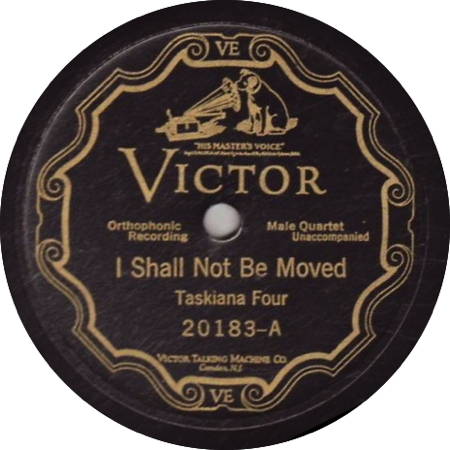 Little can be found about the Taskiana Four, though they recorded a number of tracks for Victor Orthophonic in 1926 and 1927, including "I Shall Not Be Moved." 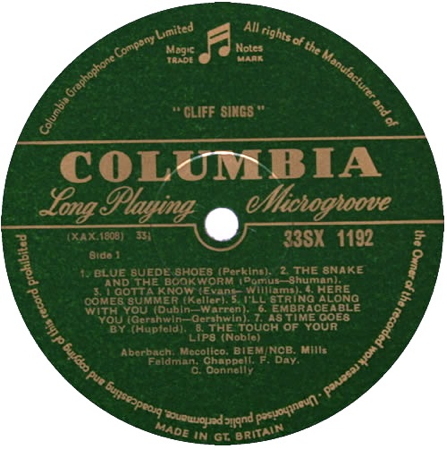 That number was recorded on 21 July, 1926, with take 2 selected to appear as the A-side of a 78 RPM, whose other B-side was titled "Join That Band" (20183). The group came from Philadelphia and performed in two New York shows, "Miss Calico" and "Africana," before disbanding in 1928. The number "I Shall Not Be Moved" is also known as "We Shall Not Be Moved." A query follows the writer credits because various sources list various writers (Jorgensen lists "Traditional," the online Folk Index lists Akley...). The first million-seller for The Four Tunes, "I Understand (Just How You Feel)" was written by Pat Best. The number was recorded by the Four Tunes in September 1953 and was a US top ten hit for the group in 1954; it became a hit again in 1964 when it was recorded by British group, Freddie and the Dreamers. The recording of Elvis singing the song was made by his friend, Eddie Fadal, when Elvis was visiting his home in Waco Texas, during his national service. 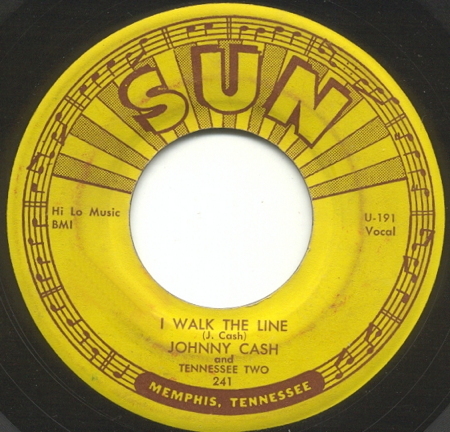 Johnny Cash wrote "I Walk The Line," his first million seller, himself. Together with The Tennessee Two, Luther Perkins and Marshall Grant, he recorded for Sun Records from 1954 until switching to Columbia in 1957. Elvis coupled "Folsom Prison Blues" with "I Walk The Line," another Cash hit, at some of his Las Vegas and Lake Tahoe shows. The earliest known recording by Elvis is Vegas August 1969, available on a number of albums, including "The Entertainer" and "From Hollywood to Vegas—Vegas August 1969." Bobby Darin was born Robert Walden Cassotto in New York in 1936. He changed his name to Darin and became a professional singer in 1956. His first three singles flopped, but he scored a big hit with the rocker "Splish Splash." Not wishing to be typecast as a rocker, Darin then adapted an old number into "Mack The Knife," winning the Grammy for Record Of The Year and getting himself voted as Best New Artist. He starred in several lightweight films before becoming recognized as a serious actor in such films as "Pressure Point" and "Captain Newman MD," before winning an Oscar nomination for his performance in "Newman." Following open-heart surgery, Bobby Darin died in 1973 aged just 37. 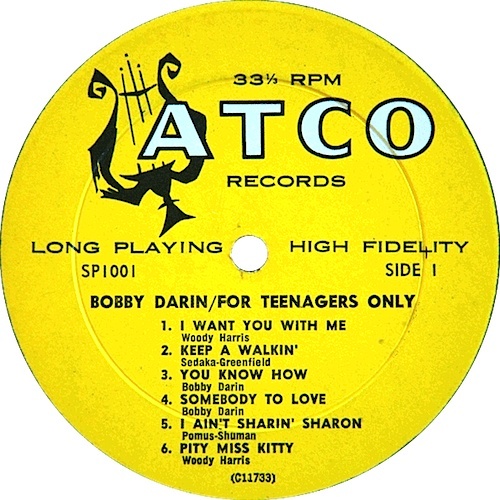 Although Bobby Darin recorded this number in July 1958, it was not released until September 1960, on his "For Teenagers Only" LP on the Atco label. The origins of "I Was Born About Ten Thousand Years Ago" can be traced back to 1894, when H.C. Verner and Harry C. Clyde wrote "I Am A Highly Educated Man," a bragging song that combined biblical and historical comedy. 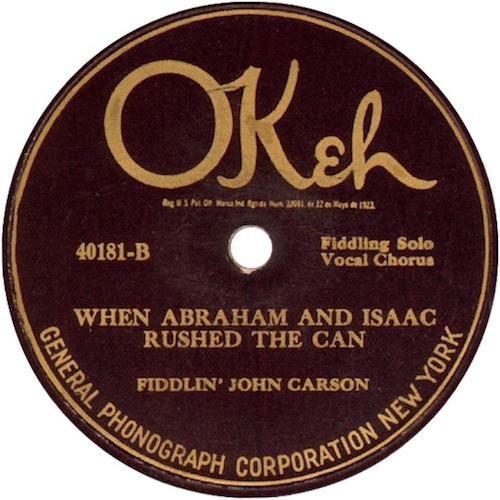 Variations on the theme abounded, with such titles as "The Bragging Song," "The Liar," "I'm The Man That Rode The Mule Around The World," "The Historian," "The Highly Educated Man" and, as is the case with Fiddlin' John Carson's recording, "When Abraham And Isaac Rushed The Can" (though this is also reported as "When Abraham And Isaac Rushed Out"). However, most titles tend to be a variation of "I was born(ed) (about) four thousand (10,000/ 4,000) years ago." Carson made the original recording in late March or early April 1924 (exact date unknown) and it was released on OKeh 40181 as the B-side of "Old And In The Way." Joe Babcock sang high harmony behind Marty Robbins for years, as part of the Glaser Brothers. Later he did studio work with the Jordanaires and formed the vocal group The Nashville Edition. He eventually sang on more than 10,000 recordings, including Elvis's own "Kentucky Rain" and "Suspicious Minds." Babcock is still performing. 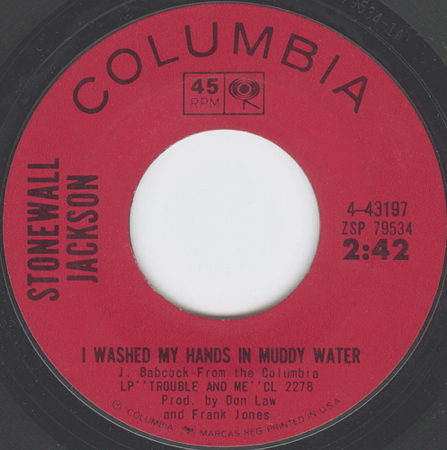 An email received from Joe Babcock indicates that he only recorded "a little demo" of "I Washed My Hands In Muddy Water" together with Okie Jones in 1965 [sic] and that Stonewall Jackson recorded the first commercial version very soon after. Jackson actually recorded his version on 5 May 1964 and it was released at the end of December that same year. Elvis presumably still felt something of the soldier away from home when he sang this number as a duet with Charlie Hodge for the fantastic "Elvis Is Back" album, recorded just after his discharge in 1960. Indeed, it was during his time in the army that the idea to record the number might have come to him: he met and jammed with the Golden Gate Quartet during a weekend leave in Paris. 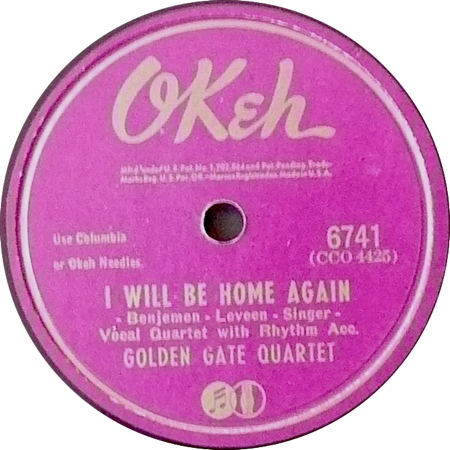 The Golden Gate Quartet must have had the same sort of sentiments when they recorded their original version of this Benny Benjamin and Lou Singer song on 16 March 1945, released on both Okeh 6741 and Columbia 37832. Willie Johnson had left the group and his replacement, Alton Bradley, sang the lead. The group began singing together in the mid-1930s as the Golden Gate Jubilee Quartet. Initially a gospel group, they moved into jazz and swing styles during the 1940s whilst continuing their gospel singing. At the end of the 1950s they moved to France, where they remain popular. Ivory Joe Hunter was born in Kirbyville, Texas, in October 1914. He performed in his own radio shows in Texas, but only gained major success when he moved to California in the 1940s. He ran his own record company, Ivory and Pacific, with which he had several number 1s on the R&B charts in the early 1950s. He disliked being labelled solely an R&B artist, however, and was equally at home with pop, ballads, gospel, and C&W. A smoker, Ivory Joe Hunter died of lung cancer in 1974. 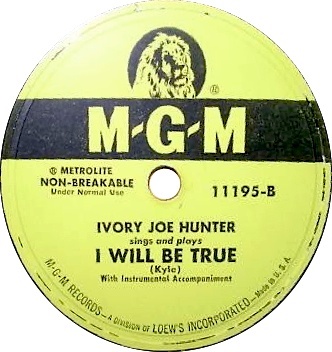 Ivory Joe Hunter's original recording of the self-penned "I Will Be True" was made probably in January 1952 (exact date unknown) and was issued that same year as the B-side of "I'm Sorry For You My Friend" on MGM 11195. Strangely, the writing credits on the label mention only one name, "Kyle." Just who Kyle is, is a mystery. Jorgensen lists Hunter as the sole writer in "Elvis Presley, A Life In Music." 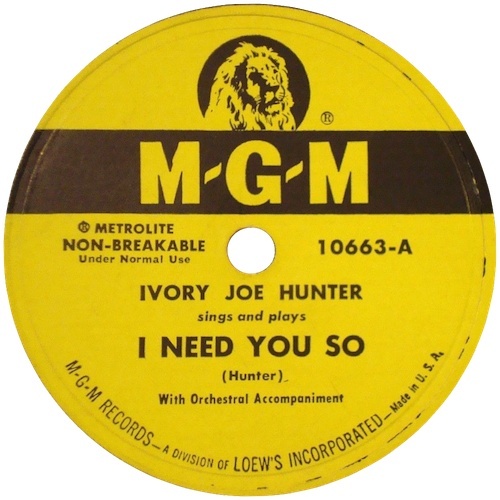 Elvis admired Ivory Joe Hunter and sang several of his songs throughout his career: "My Wish Came True," "I Need You So," Ain't That Loving You, Baby" and "It's Still Here," as well as "I Will Be True." Although issued as studio recordings, both "I Will Be True" and "It's Still Here" are examples of Elvis singing for himself at a studio piano, during a break in the actual recording proceedings (as, indeed, is "I Will Take You Home Again Kathleen"). An informal recording of Elvis singing "I Will Be True" was made in 1959, when he was stationed in Germany. The recording was made in the house in Goethestasse, Bad Nauheim, and was released on 1997's "Platinum: A Life In Music" as part of the so-called "Bad Nauheim Medley." Both The Four Aces and The Vagabonds recorded "I Wonder, I Wonder, I Wonder" for the Trilon label in 1946. 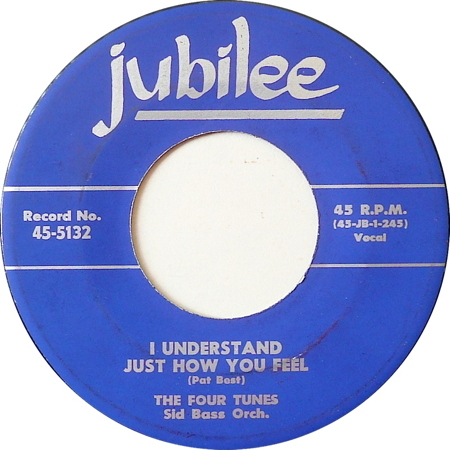 The Four Aces made both an instrumental and a vocal version in December 1946, but the matrix number of the Vagbonds' recording indicates that it was made earlier still. Indeed, The Vagabonds recorded the song as a favour to its composer, Daryl Hutchins, and "a slew of cover versions were [sic] subsequently issued" (see Interesting link, below). 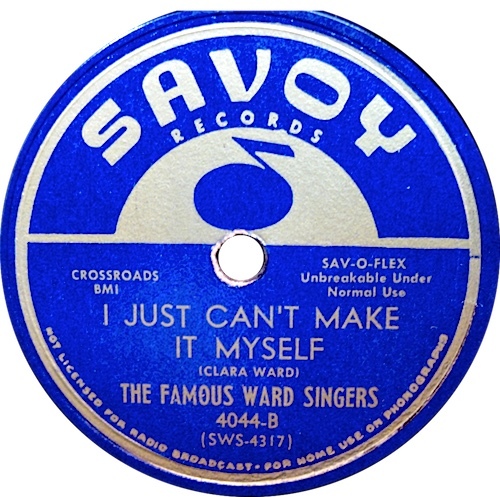 On 16 November 1946, one month before The Four Aces recording, Billboard reported that The Vagabonds' version of "I Wonder, I Wonder, I Wonder" was available as a single on Trilon 114. It is fairly safe to assume, then, that The Vagabonds were responsible for the original recording of "I Wonder, I Wonder, I Wonder." The Vagabonds were a musical comedy group. They enjoyed their greatest success in the 1940s and 1950s, but had a career that spanned more than forty years, starting in 1934 and going on until 1976. The group's membership varied during that time, with just one permanent member, Dom Germano. The core members, who formed the group between 1940 and 1957, were Dom Germano, Attilio "Tilio" Risso, Al Torrieri, and Wilbur "Pete" Peterson. Elvis's recording was an informal one, made on a household tape-recorder and never intended for release. 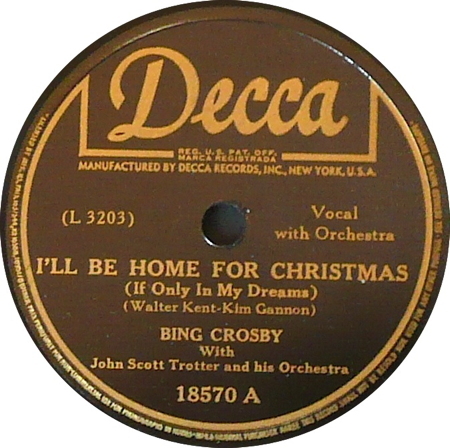 Bing Crosby's influence in the first half of the 20th century was similar to that of Elvis's in the second half: huge record sales, the most popular radio star, a massive box-office draw and the ability to sing in a variety of styles. He was born in 1903 as Harry Lillis Crosby, the Bing coming from his childhood nickname Bingo, a comic-strip character of which he was fond. Bing Crosby died in October 1977. 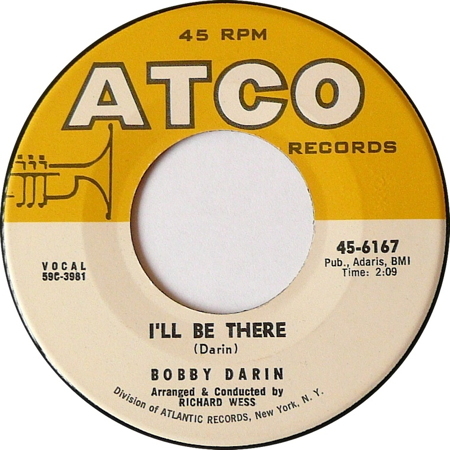 "I'll Be There" seems to be a popular title for a song, though the Ray Price (1954) and The Jackson 5 (1970) versions are two totally different numbers. Bobby Darin recorded the original of the "real" song on 22 July 1959 for Atco, but it was not released until the July of the following year. Gerry & The Pacemakers (who also had a hit with "You'll Never Walk Alone") recorded this track in 1963, including the verse that Elvis left out: I'll miss you and in my dreams I'll kiss you/Then wish you luck in your new affair/So baby if you miss me/All you gotta do is call me/Don't you worry darling, I'll be there. 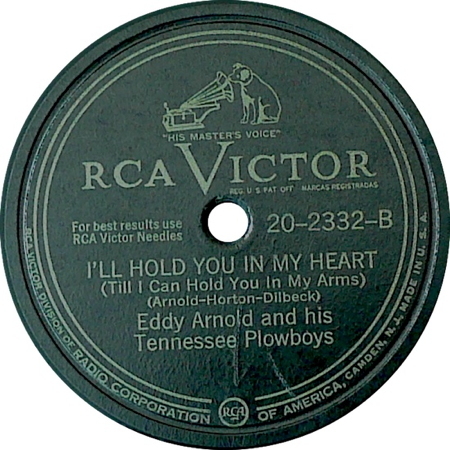 Eddy Arnold's original spent no less than 21 weeks at the top of Billboard's Country chart in 1947, a joint record with Hank Snow's "I'm Movin' On" (also recorded by Elvis) and Webb Pierce's "In The Jailhouse Now." Tom Parker managed Eddy Arnold before he moved on to better things with Elvis (better for Parker, of course!). Eddy Arnold died in May 2008. Hands up everyone who thought that Welshman Tom Jones had the original version — be honest! 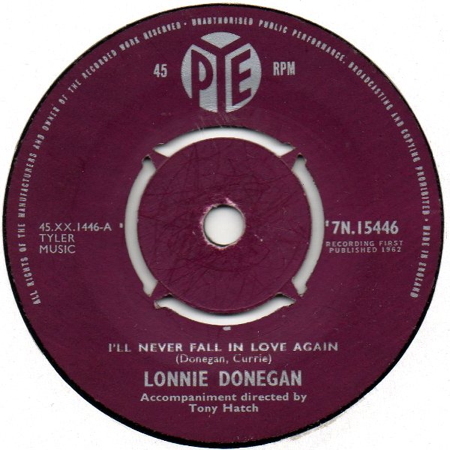 The full title is "(It Looks Like) I'll Never Fall In Love Again" and should not be confused with Burt Bacharach's "I'll Never Fall In Love Again" which is a totally different number, dating from 1968. Lonnie Donegan, the great British skiffle hero, was born in Scotland in 1931. He enjoyed huge succes in the 1950s and early part of the 1960s. He died in November 2002. Although this number is credited to Lonnie Donegan and Jimmy Currie, the tune is similar to a 1950's recording by the Sammy Kaye Orchestra, called "Wanderin'" (singer Tony Alamo), which itself is based on what is described as a "traditional number." Indeed, "Wanderin'" had earlier been recorded on Columbia 1585-D by Vernon Dalhart in 1928! Extended information regarding "I'll Never Fall In Love Again." 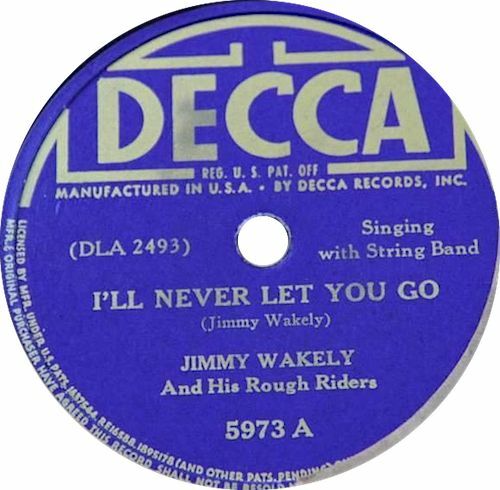 Jimmy Wakely got his break into showbusiness in 1940, when his trio was hired to play in Gene Autry's radio show. He left after two years to pursue his own career in music and films, appearing in well over 60 as a cowboy actor. He recorded his original version of "I'll Never Let You Go (Little Darlin')," which he wrote himself, on 1 July 1941, for release on Decca 5973. Wakely died in 1982. 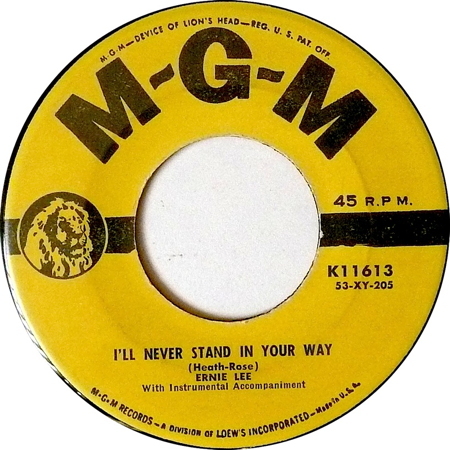 Fred Rose and Hy Heath wrote "I'll Never Stand In Your Way" in 1953, the same year that Ernie Lee and Joni James, amongst others, recorded the number. James's version was released some days before that of Lee, in November 1953, but Ernie Lee's recording carries an earlier matrix number (53S6023, as opposed to 53S6074), so was probably recorded first. On January 4, 1954, Elvis visited the Memphis Recording Service to make his second personal recording, coupling "I'll Never Stand In Your Way" with "It Wouldn't Be The Same Without You." It is possible that Elvis recorded "I'll Never Stand In Your Way" at Sun Records, but this has not been confirmed. Kui Lee, the composer of "I'll Remember You," was born in 1932, a mixture of Hawaiian, Chinese, and Scottish ancestry. He loved Hawaii and is said to have written this beautiful number when leaving it for one of his trips to work as an entertainer in mainland USA. He died on 3 December, 1966. Lee was working as a doorman at a nightclub in Hawai'i, where Don Ho was a singer. 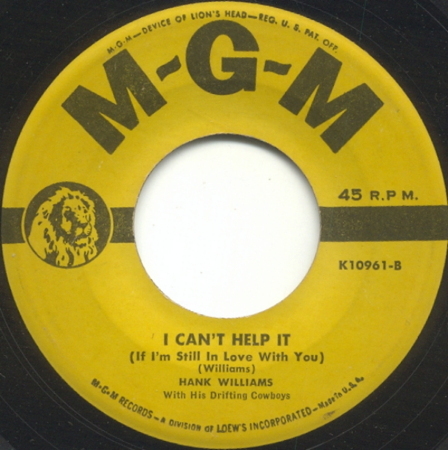 Ho recorded Lee's song, probably in mid-1965 and released it as the B-side of a single on Reprise 0388 that same year. 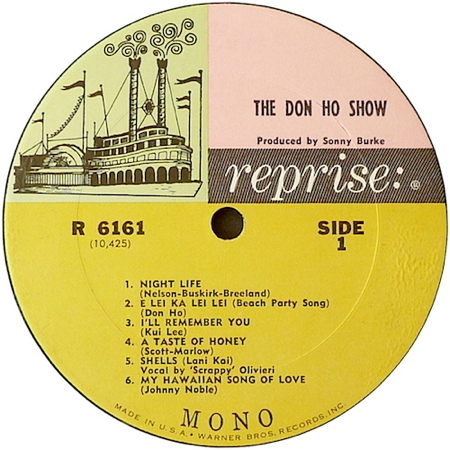 It also appeared on his album "The Don Ho Show!" (Reprise R/RS 6161). Ho died, aged almost 77, on 14 April 2007. In 1875, the songwriter George Persley (not "Presley") composed the song "Barney, Take Me Home Again," with words by Arthur French, dedicated to his friend, Thomas Westendorf. Westendorf himself wrote an answer song called "I'll Take You Home Again, Kathleen" in 1875 or1876. 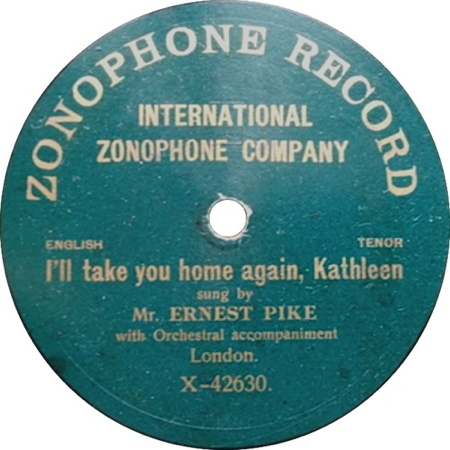 Ernest Pike, born in 1871, recorded his original version of that number in about mid 1907 and it was released as a single-sided Zonophone disk, number X-42630. Pike recorded the number again three years later, this time together with Stanley Pike, for release on an Edison cylinder, number 13982. Pike was a popular English tenor, who recorded under several names and with a prolific output. He died in 1936. Elvis made a home-recording of this number in 1959, whilst staying in Goethestrasse, Bad Nauheim, Germany, during his military service, but made a studio recording on 19 May 1971. Can you provide a recording date? contact me. 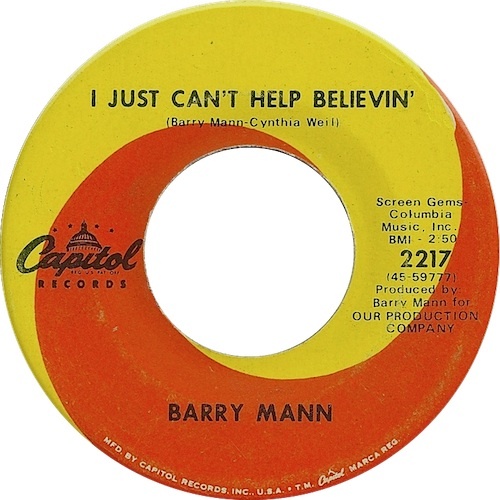 Born in 1942, Carl Mann started singing professionally in the late 1950s. He seemed to specialise in making rockabilly versions of popular songs. He recorded for Phillips International, a label owned by Sam Phillips—another Elvis connection! His two main successes came with "Pretend" and "Mona Lisa." Although the original was not a hit, Elvis copied the performance very closely. Canadian-born Hank Snow signed with RCA in 1934 and stayed with them for a record-breaking 45 years. Snow moved to the USA in the mid-1940s and became a regular at the Grand Ole Opry in 1950. 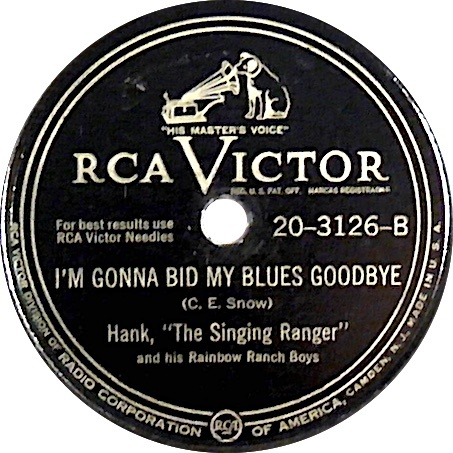 Snow recorded the original version of "I'm Gonna Bid My Blues Goodbye" on 17 December, 1945, at the Victor recording studio in Montreal, Canada. 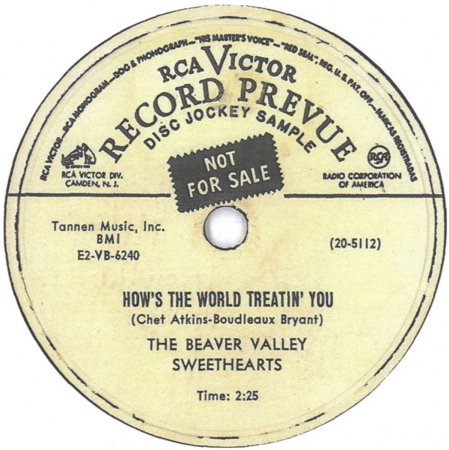 It was released on RCA Victor 20-3126, as the B-side of "Just A Faded Petal From A Beautiful Bouquet," which was recorded during the same session. Hank Snow became a US citizen in 1958. Snow died in December 1999, aged 85. Culley Holt, who wrote this number, was the original bass singer for The Jordanaires. The group went on to back just about everybody in Country music, along with numerous other recording artists, too, one of whom was, of course, Elvis Presley! But did The Jordanaires really record this number first? 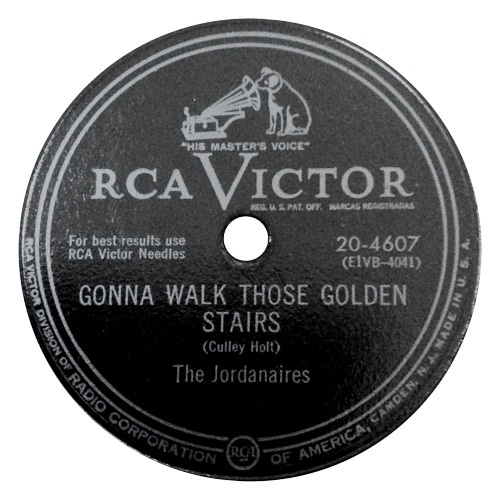 Well, according to their own website (see http://www.jordanaires.net/about/disco/listing.htm) they released the number in 1950 on RCA 20-4607 as "Gonna Walk Those Golden Stairs." In reply to my own enquiry to the site, I was told that the recording was made in 1949, and that they would contact me again if a more accurate date could be established. I heard nothing more. But RCA 20-4607 was not actually released until March 1952, so did they really wait three years between recording and release? One usually reliable site provides a recording date of 12 October 1951. The other candidate for original recording artist is The Crusaders Quartet, who recorded and released their own version in 1952 on Bibletone 4011 as "I'll Walk Them Golden Stairs (When I Die)." However, I have been unable to locate an actual date for this recording. So who did record this number first, and when? contact me. Thanks to all the people who have provided feedback and additional information that I've been able to use to improve this site and its contents: Garth Bond (UK? ), Sebastiano Cecere (Italy), Chris Deakin (UK), Stig Ericsson (Sweden), Mark Hillier (UK), Joop Jansen (Netherlands), Torben Jensen (Denmark), Robin Jones (Saudi Arabia), Bob Moke (USA), Henk Muller (Netherlands), Rami Poutiainen (Finland), Aad Sala (Netherlands), Trevor Simpson (UK), Leroy Smith (Netherlands), Philippe Spard (France), Kris Verdonck (Belgium). If I've forgotten anyone, please forgive me! For questions and comments about this page, contact me. All original work presented here is copyrighted by the author. This means do NOT reproduce without prior permission. For further information contact me. Parts of this site use the Perfect 'Holy Grail' 3 Column Liquid Layout by Matthew James Taylor. View more website layouts and web design articles.